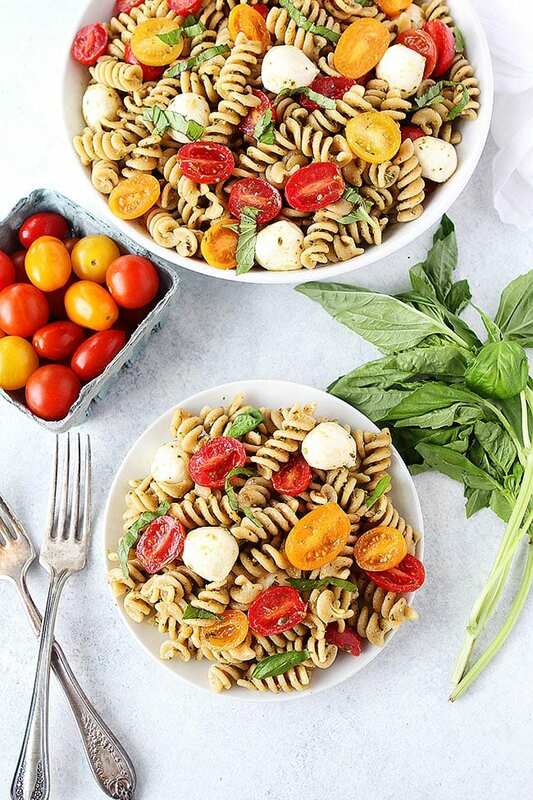 You only need 5 ingredients to make this easy Pesto Pasta Salad! 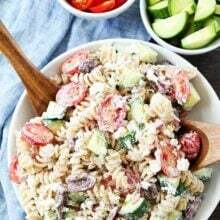 It is the perfect pasta salad for summertime! Who is ready for summer? Both of my hands are raised. Our boys are currently working on our summer bucket list and they have come up with some fun ideas. It is going to be a busy summer, but I don’t mind being busy if it is all fun. Of course, we will still be working to make sure you guys have delicious recipes to eat all summer, but good food is fun to me:) I love my job! 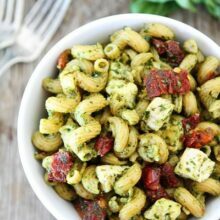 Speaking of good food, you guys are going to LOVE this Pesto Pasta Salad. 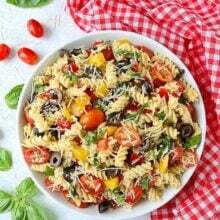 It is the perfect summer pasta salad recipe and guess what, you only need FIVE ingredients! During the summer, we are all about easy meals because we are too busy having fun and this salad is super easy and SO delicious! We love using DeLallo’s whole wheat pasta, it is the BEST whole wheat pasta, even our boys love it. 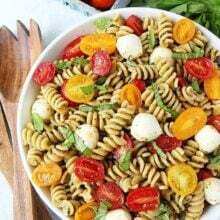 If you need the pasta salad to be gluten-free, you can use DeLallo’s gluten-free pasta, it is really good too. We use Fusilli pasta, but you can use your favorite shape. We like to use fresh mozzarella bocconcini, the small balls of mozzarella cheese for this recipe. If you can’t find it, you can use regular mozzarella, just cut it into bite size pieces. 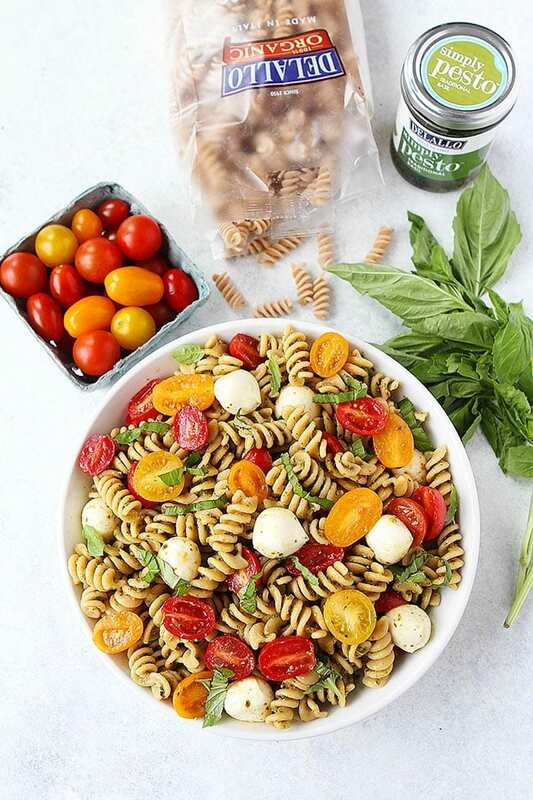 All of these ingredients come together to create a delicious pasta salad that is bursting with summer flavors. I know most people don’t like to cook during the hot summer months, but don’t worry, this pasta salad doesn’t require a lot of cooking. All you have to do is boil pasta, super simple! After the pasta is done cooking, rinse it with cold water. This is a cold pasta salad, making it perfect for summertime. And after it is all put together you can keep it in the refrigerator until you are ready to eat. You can make it in the morning and eat it for lunch or dinner. I love that this recipe can be made in advance! 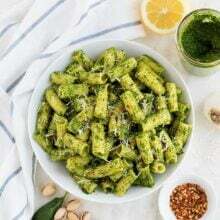 Take it easy this summer and make this Pesto Pasta Salad for lunch, dinner, and all of your summer parties and potlucks! It is a hit every time! 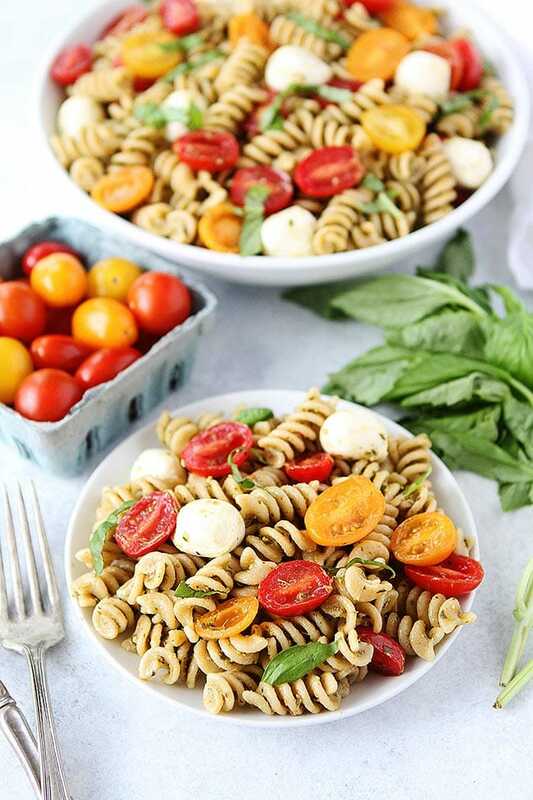 This easy pasta salad is a summertime favorite! Enjoy it for lunch, dinner, or take it to a potluck to share with friends and family. Bring a large pot of salted water to a boil and add the pasta. Cook until al dente, according to package directions. Drain the pasta in a colander and rinse well with cold water; drain again and transfer to a large serving bowl. Add the pesto and stir until the pasta is well coated. Stir in the tomatoes, fresh mozzarella, and basil. Season with salt and pepper, to taste. Serve. I love pasta, thanks for this amazing recipe, it looks so great. Perfect Summer potluck side dish!! This is right up my alley! Totally screams Summer. I’m ready for months of fun and sun! Only 5 ingredients?! Say whaaaaat! Such a classic combination turned into pasta salad! Excited about the idea of using peso as a sauce instead of something mayo based! I never get tired of fresh recipes like this and DeLallo Whole Wheat Pasta is THE BEST! you’ll never go wrong with pesto and pasta!! Summer in a bowl! 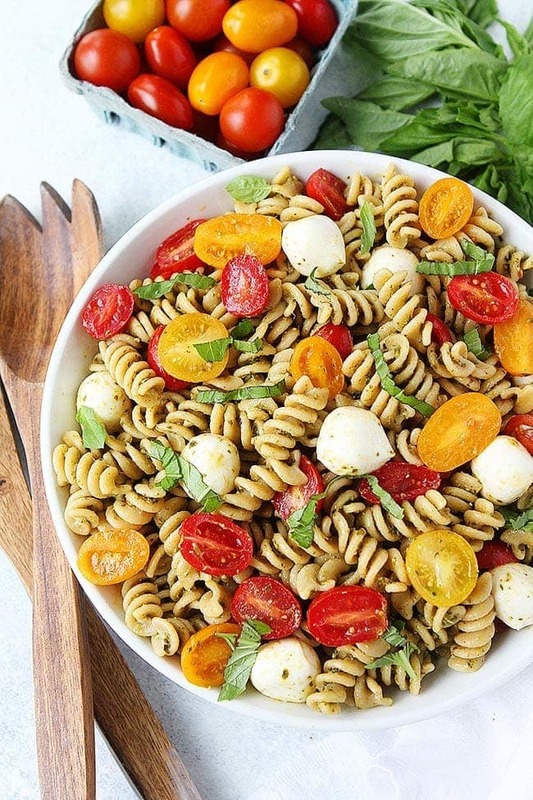 Love how colorful this pasta salad is! Can you make this the day before? Delicious and easy. My kids ate it all up too! They lov d it as well.